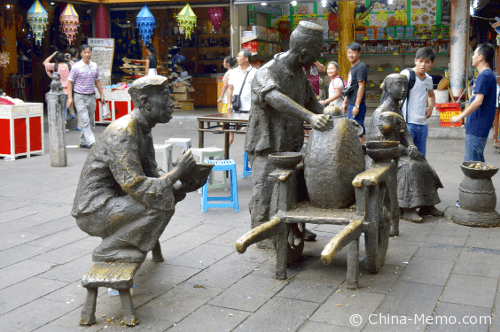 This is my experience of Xian two day DIY (itinerary) , visited: Drum Tower, Muslim street (Huifang Style Street), Xian City Wall, Dayan Pagoda North Square and Terracotta Warriors. In this post, I also include some travel tips and my reflection on this Xian two day DIY plan. 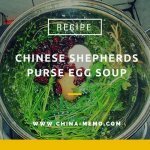 So if you want to visit Xian by yourself, hope this is useful for you. I have added the details for each place in other posts, you may check them from this link for Xian Food Travel. I only had two days for Xian, if take out the time for taking flight, it was actually just one and half day to spend. So, I could only visit some famous sites, but I think it went ok. Leave some places I can visit next time. 9:00-12:00: Take flight from Guiyang Longdongbao airport to Xian Xianyang airport (after my one day trip at Guizhou Huangguoshu). Take Xian airport shuttle bus (Line 1) to Bell Tower /Drum Tower (final stop). There are total 6 shuttle lines, make sure you take the right one. 12:00-13:00: Check in at Hotel. I stayed at Xian Melody hotel, which is just at the shuttle bus final stop opposite Drum Tower, very convenient. I also noticed there were people store bags at the hotel, 10 Yuan per bag (but they don’t store cameras). If you stay at this hotel, there is no charge for bag store, as I did it in the next day. 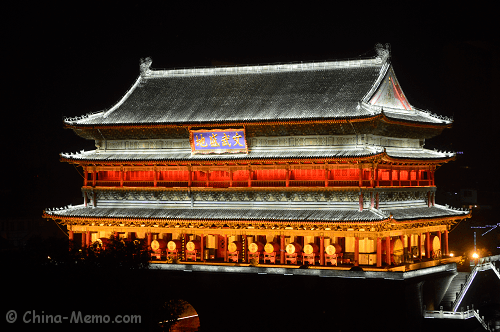 You can read more about Xian Drum Tower, or click the picture to go to that page. 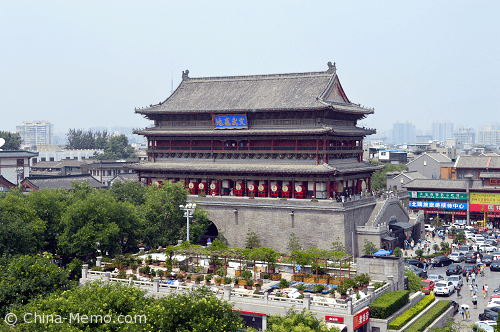 13:00-15:00: Walk cross the street to Xian Muslim Street (aka Huifang Style Street in TripAdvisor), which is just behind the Drum Tower. It is a famous food street, a must visit place for foodies, plenty food choices and a good place to get know Xi’an local food. Click the link or the picture to read more about Xian Muslim Street and many pictures I took for Xian Muslim Street Food (1), (2) and (3). 15:00-16:00: Xian Drum Tower. If you are not hungry for food, you can visit Drum Tower first as it just sits in front of Muslim street entrance. If you just walk through, half hour should be enough unless you watch the Drum performance (last about 15 minutes, several times every day). I had a video clip for the Xian drum performance, you can watch it in the post for Xian Drum Tower or find it in my Youtube channel. You may visit Bell Tower after this, which is not far away. You can buy a set ticket for Drum and Bell Tower (RMB 50 Yuan for two and RMB 35 for one). 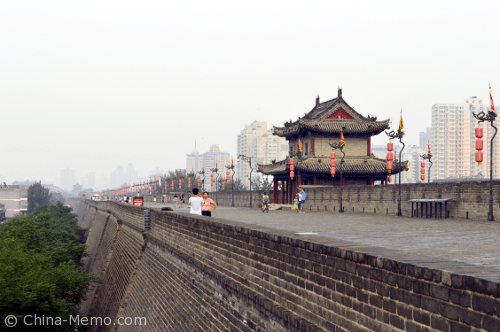 16:00-18:00: Take Bus from Drum Tower to Xian City Wall. Bus stop is just outside the Drum Tower. Unfortunately I can’t remember which bus route I took, but any bus stops at West Gate will be fine. (I noticed this bus did not have the English announcement, Aug, 2014). It just has few stops and takes less than 15 minutes. I really like City Wall, a place more than just being fun and interesting, wish I could have been there longer. Evening view is even nicer when it has all lights on. Click the picture will direct you to see page Xian City Wall. 18:00-20:00: Take a motor taxi (about 20 mins) from City Wall to Dayan Pagoda North Square. Many restaurants nearby and I had dinner at a snack restaurant near the square. 20:00-21:30: Dayan Pagoda North Square and music fountain, there are sculptures, garden art and a famous music fountain show in the evening (9pm). I have added a video clip for the fountain show in this post. I couldn't enjoy the show though as too many people. You need to be there early to get a good spot if you want to watch it. 21:30-22:00: Get back to hotel, took a motor taxi again, which turned out to be the most fun part of the evening. 7:30-8:00: Hotel check out and store luggage at hotel. (Check out after 2pm will be charged extra). Take Bus 205 from Drum Tower to Train Station, about 20 mins, which may vary depending on the traffic. The bus stop is at the right hand of Melody hotel, not far away. 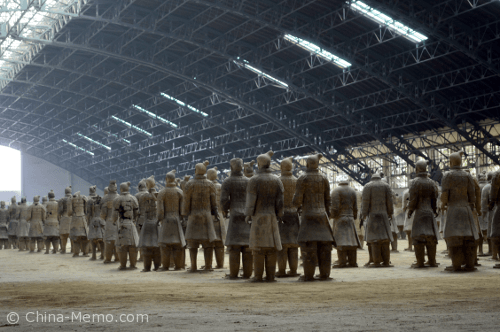 9:30-12:30: Terracotta Warriors. Planned to visit Huaqing Hot Spring after this, but decided to cancel as not sure if the time was enough. 12:30-14:30: Take a “wrong” bus (Bus 914) back to Xi’an, well, not wrong, just has more stops than Bus 306 so takes longer time. (More on this later on in another post). 14:30-15:30: revisit Muslim street and bought some Xi’an snack (green bean cakes) for family. (Could go to see Bell Tower). 15:30-16:00: back to hotel and get luggage. 16:00-17:00: Take airport shuttle bus to Xian Xianyang airport. Fly back to Changsha at 1900. Day 1: 13:00 - 16:00: Warrior. 16:00-19:00 Huaqing Hot Spring and watch the evening show there. Day 2: 9:00-11:00: Drum & Bell Tower, 11:00-13:00: Muslim Street, 13:00-15:00:City Wall. Could visit Dayan Pagoda, if I don't catch the 7pm flight. 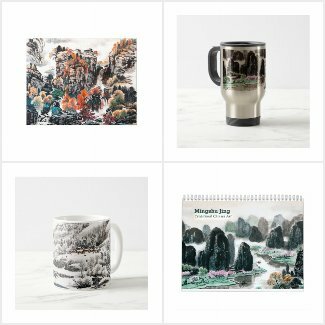 More information can be found from this Xian tourism site, it is not a travel agency site, so nothing like ads for tours, but lots useful information from a Chinese government site.